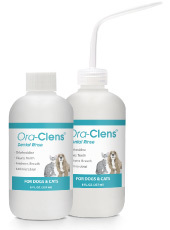 Ora-Clens® Dental Rinse An effective, safe and palatable, fresh antimicrobial formula for reducing plaque and freshening breath in dogs and cats. Contains antimicrobial, anti-plaque and anti-calculus properties to aid in tooth and gum disease prevention. Convenient at it's best! When you can't brush, flush with Ora-Clens®! Brushing your pet's teeth is important but if you're short on time or your pet just won't allow it, Ora-Clens® dental rinse is great for getting rid of the bad breath and helping to prevent dental disease. Ora-Clens® Dental Wipes Active Ingredient .13% Chlorhexidine Gluconate - This active ingredient is an effective antiseptic, helps to reduce dental plaque and oral bacteria which causes bad breath. Ease of Use Shake well before each use. Rinse daily following each meal or as directed by your Veterinarian. Hold bottle upright, below your pet’s field of vision. Gently lift the upper lip to expose the teeth and gums. Point and squeeze to apply a gentle stream along the gum line. Ora-Clens® dispenses rapidly and completely covers the entire oral cavity, even hard-to-reach areas. Avoid touching the gum with the applicator tip to avoid injury in case your pet moves. Sorbitol, 0.13% Chlorhexidine Gluconate, Zinc Acetate, 0.05% Cetylpyridinium Chloride, Flavor. Alcohol-free. 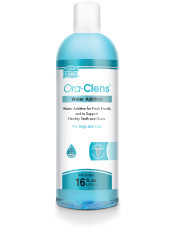 Ora-Clens® Water Additive provides a simple way to keep teeth bright and breath fresh. Unchecked plaque formation can lead to the development of periodontal disease, the number one clinical condition affecting cats and dogs today. Simply add this veterinary solution to your pet's daily drinking water to reduce the formation of plaque and keep your pet's teeth and gums healthy. Ora-Clens® Dual Ended Toothbrush was designed to meet the brushing and dental needs of dogs and cats. Each end features a brush that is a different size to ensure that dogs and cats of all sizes have an appropriate brush. The toothbrush is also long and slender to ensure that it easily reaches even the farthest molars in your pet's mouth without causing undue discomfort. This toothbrush is flexible and lightweight to ensure that brushing your pet's teeth is a simple task. The toothbrush also features a design pattern of raised paws for a simple but fun decorative flair. 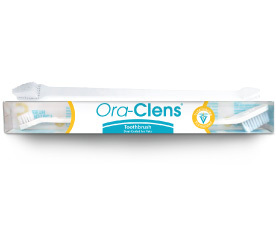 Use the brushes with Ora-Clens Dental Gel Toothpaste for comprehensive dental care. Ora-Clens® Dental Gel Toothpaste works to freshen breath and gently clean your pet's teeth and gums. This enzymatic toothpaste uses ingredients to catalyze the effects of the baking soda solution to kill bacteria that can lead to dental disease. 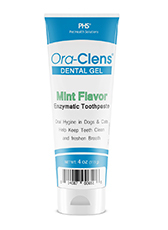 Ora-Clens Dental Gel also features a delightful mint flavor to provide a pleasing taste to your pet while brushing and freshens breath. This gel is safe for use on cats and dogs of all sizes and ages. Water, Propylene Glycol, Glycerine, Pyrogenic Silica, Sodium Carboxymethylcellulose, Polysorbate 80, Glucose & Lactoperoxide & Glucose Oxidase, Mentha Piperita (Peppermint) Oil, Mentha Spicata (Spearmint) Oul, Sodium Bicarbonate (baking soda), Methylparaben, Propylparaben, Blue #1, Yellow #5..
Ora-Clens® 1-TDC supports healthy teeth and gums in dogs and cats. 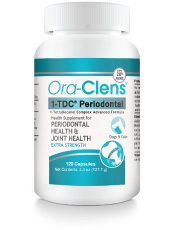 Ora-Clens 1-TDC Periodontal contains a modified molecule, 1-tetradecanol complex, that is a clinically proven and veterinarian-recommended way to combat a periodontal disease that boasts improved dental health. It is recommended for natural support of gum tissue and joint health as an anti-inflammatory. Tetradecanol complex provides a significant improvement in gingival and periodontal health and can be an alternative, safe and non-invasive therapeutic approach in pets suffering from destructive periodontal diseases. 1-TDC has the unique ability to directly and positively support both periodontal and joint health as one economical solution. In a clinical study, the esterified fatty acids of 1-TDC also improved the general disposition and functional ability in dogs suffering from arthritis. These fatty acids offer an alternative to more traditional therapies for treating arthritis in canines. These flavored fish capsules are easy to apply to pet's teeth and taste great to ensure that your pet will thoroughly enjoy caring for their teeth and joints in the future. Carob, Fish Oil, gelatin, Glycerin, Purified Water, Soybean Oil. 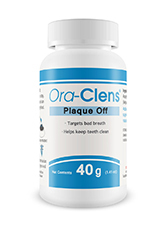 Ora-Clens® Plaque Control works to fight the bacteria that produce plaque, tartar and bad breath in cats and dogs. Plaque and tartar can cause gum disease, tooth decay, and other dental problems. This product uses natural ingredients to prevent these diseases at their source with a formula that contains no sugar, preservatives, or gluten. Ora-Clens Plaque Control is simple to administer to your pet; simply mix a small dosage of powder into your dog's wet or dry food. This bottle comes with 40 grams of powder approximately 60 doses. Ora-Clens® Tartar & Plaque Wipes An effective and safe dental solution with antimicrobial activities reducing the plaque, dental calculus and tartar buildup on pet's teeth over time. 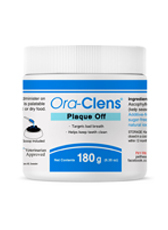 Ora-Clens® also reduces bacteria that cause bad breath. 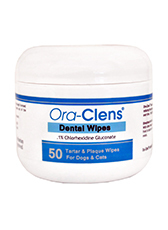 Textured Pads Ora-Clens® Dental wipes pads are specially textured to assist in removing debris from pet's teeth. It's also great for removing plaque and tartar leaving pet's teeth clean and polished! Ora-Clens® Dental Wipes Active Ingredient 1% Chlorhexidine Gluconate - This active ingredient is an effective antiseptic, helps to reduce dental plaque and oral bacteria which causes bad breath. 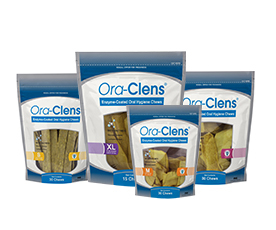 Ora-Clens® Oral Hygiene Chews help clean your dog's teeth while they chew. These beefhide treats are coated with enzymes that help remove plaque and prevent harmful bacteria from building up.